Photovoltaics and photonics, network of sensors base on TFT, intelligent sensors, x-ray and nuclear silicon detectors. Design, fabrication, analysis and testing of circuits and nano and microsystems. until year 2012 providing additional equipment to laboratory and mastering technology of quantum multilayer structures and maintain problems of scalability. Cooperation mainly with Polish Institutes. till year 2015 fabrication of quantum solar cell structures as shown on figure 1. Cooperation on EU level. The goal of this project is to verify of new solar cell structure (A,B,C,D) schematically shown on figure 1. As to authors experience A,B and D propositions can be realized. Fig. 1. 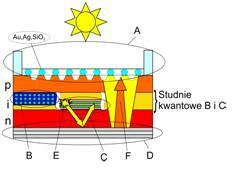 Schema of proposed structure of solar cell. A- Nanotecsturized front electrode, B- Amorphous silicon film with homogeneous placed nanocrystals, C- a-Si:H/a-Ge:H or a-Si:H/μc-Si:H quantum wells, scalling problem, D - Back electrode in a form of Bragg mirror and Lambertian reflection, E - Photon from radiant recombination reflected from back electrode “D”, F - Not absorbed photons reflected from back electrode. C - systems of about 300 quantum wells exploitative multilayer configuration ,based on a-Si:H/μc-Si:H or a-Si:H/a-SiGe:H (the size : Gauss Statistics around 5nm) that increase efficiency with respect of better effective absorption and separation of charge. These solutions go into the dimensions, which are considered to be quantum, i.e. from 1 to 20nm aimed on size of 5nm, near at tunnel currents and resonance absorption emerge related with appearance of additional conductance band and multiband absorption of highly energetic photons.